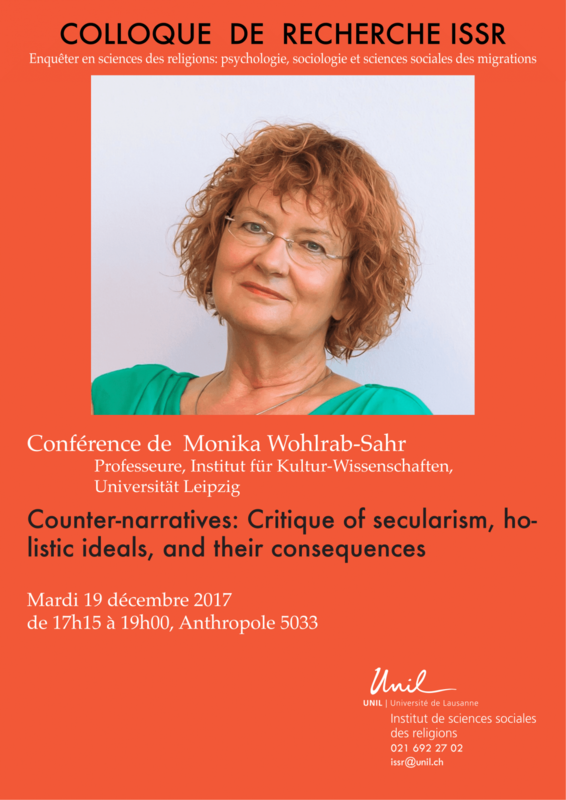 "Counter-narratives: Critique of secularism, holistic ideals, and their consequences" is the title of the presentation that our director Monika Wohlrab-Sahr will deliver at the research colloquium of the Institut de sciences sociales des religions (ISSR) in Lausanne on Tuesday, 19 December 2017, 5 p.m. Whereas concepts of secularization and disenchantment have been central elements of modernization theories for decades, in the meantime they seem to be widely discredited, especially when being used to make sense of non-European developments. Diagnoses of secularization have been demystified as “myths” of modernity, and concepts as well as institutions of secularism have been discredited as –often violent– Western impositions on the non-Western world. Not only their political imposition, it is argued in these counter-narratives, but also the narratives of secularization and the conceptual divide between the secular and the religious as such, are alien to the worlds on which they have been imposed. The paper takes a closer look at central strands of this critique, especially with regard to the Islamicate world and to India. The thesis is that parts of this critique, implicitly or explicitly, employ concepts of wholeness and totality, juxtaposed to the divisive nature of secularization and secularism. This resonates with early – e.g. Romantic – critiques of secularization in the European history. Against the very intentions of the critics, it is argued, this entails the danger of an “othering” of the non-European world. On top, it leaves the central question behind concepts of secularity, secularization, and secularism chronically unanswered: the question if distinctions and differentiations between the religious and the non-religious in the Non-west exist, and if yes, what their origins are and what they look like.